Maria Bueno won seven Grand Slam singles titles. Maria Esther Andion Bueno rose to the top of women’s tennis in the ’50s and ’60s, employing her natural ability to carve a unique mark on the women’s game. Bueno grew up during an era prior to the movement known as women’s liberation. Back then she was a novelty—a woman born with natural athletic gifts who lived to find and fulfill her destiny. Such a feat was rare in those days because even superlative women often remained wedged in their seats at the back of the bus. Remarkably, Bueno won seven grand slam singles championships, three Wimbledons, and four U.S. Open titles, 11 doubles championships with six different partners, and one mixed doubles title with partner Bob Howe at the French Championships in 1960—for a total of 19 grand slam crowns. She was ranked in the top 10 in the world from 1958 through 1960 and then again from 1962 through 1968. She held the No. 1 ranking in 1959, 1960, and in 1964. Bueno, born on Oct. 11, 1939, resided in Sau Paulo, Brazil. Her father and mother both loved and played tennis socially. The family lived modestly in comfortable middle class society in a home directly across the street from a tennis club facility. Bueno naturally found the game very early in life and began playing without any formal coaching. Along with her older brother, the Brazilian adopted tennis as her calling. She and her sibling played constantly. Bueno moved into the top 10 for the first time in 1958. As a natural athlete, Bueno found success early and triumphed often because of her formidable talent and her staunch determination to succeed in the sport. 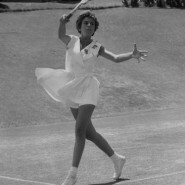 Maria Bueno became the first woman from South America to win at Wimbledon. Called a “latin sliver of fire and ice,” in her second Wimbledon win over Sandra Reynolds by the Associated Press on July 3, 1960, Bueno imposed her presence on the tennis world and in the process engaged the media with her flair as well as her game. Her style, grace, and easy movement won her accolades around the world as she stormed the European courts with her early serve and volley style of play. She rushed the net and hit with power and depth employing sharp angled volleys. At the time, at 5’7,” Bueno was considered tall and thin, weighing in at 110 pounds. Her nickname was the Brazilian Swallow because she appeared to swoop in quickly to dominate at the net. Enhancing her reputation as a player, Bueno was always stylish dressed in the best and often the frilliest tennis attire of the day. Once wearing a traditional white tennis dress with pink lining at Wimbledon, she had the crowd in consternation with the occasional flounce of pink as she mowed down her competition. While other women’s matches were relegated to back courts, Bueno, always a crowd favorite, found her matches scheduled on the main courts with the stands packed. Even the male pros gave up enthralling card games to watch the young Brazilian play. Bueno won her first tournament at age 12 and at the age of 14 she became Brazil’s women’s singles champion. Finally in order to advance her game, she moved on to play and win at the Orange Bowl in 1957, staying on to play the Caribbean Circuit. At the time Bueno was playing it was considered important to win in all categories—singles, doubles and mixed doubles. The ability to play well and win in varied formats meant that you would always get an invitation to play at another tournament next week. 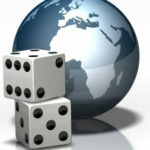 That meant food and lodging. Life on the road was not easy for the young Brazilian. Bueno suffered not only from lack of financial wherewithal but also from the separation from her family. She missed her brother the most. In order to complete her rise to the top, in 1958 Bueno left for Europe to join the international circuit, where she won her first single’s title at the Italian Championships. 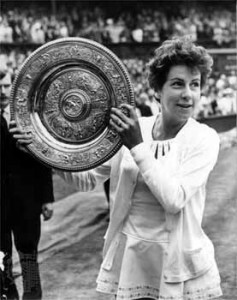 Bueno’s first grand slam title came at Wimbledon, where she teamed with the great Althea Gibson to win the women’s doubles championship in 1958. The press and the professionals were beginning to pay attention to this little Brazilian wonder. Bueno won her first singles Grand Slam title at Wimbledon in 1959 defeating Darlene Hard. At the end of the summer Bueno also won the U.S. Championships and in the process earned the No. 1 ranking. The Associated Press accorded her the award for the 1959 Female Athlete of the Year. Bueno won the Wimbledon singles title three times and the doubles crown five times. Grass quickly became her favorite surface, suiting her attacking style of play. Bueno became the darling of Wimbledon. In all she won eight Wimbledon titles, three in singles in 1959, 1960 and 1964. She won five doubles titles in 1958, 1960, 1963, 1965, and 1966 with partners Althea Gibson, Darlene Hard (two), Billie Jean King and Nancy Richey. Bueno also won the U.S. Championships eight times during years when the tournament was played on grass. 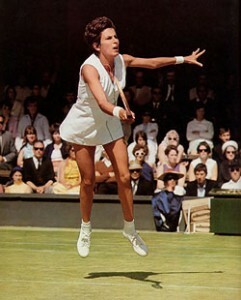 She captured the title four times in singles in 1959, 1963, 1964, and 1966 and four times in doubles in 1960, 1962, 1966 and 1968 with Darlene Hard (two), Nancy Richey and Margaret Court. Bueno played in the finals of the French Open in 1964, losing to Margaret Court 5-7, 6-1, 6-2. The Brazilian also played in the finals of the Australian Open in 1965 losing again to Margaret Court 5-7, 6-4, 5-2 (retired). Her flamboyance, her commitment to training and her rigorous style of play led to many agonizing injuries for the young woman who bore them without complaint. Even though Bueno embraced her life and was outgoing and easy to approach, she remained private and reserved in her personal life. She played her best tennis as an amateur, enduring poverty and injuries in pursuit of playing time and world prominence. By the time prize money began to be awarded, Bueno suffered with arm and leg injuries severe enough to keep her from competition after 1968. She did come back in the seventies to play a few matches, even winning the Japan Open in 1974—to serve as her one professional title as contrasted to her 62 titles as an amateur.